These are some of my family's favorite recipes. I hope you enjoy them as much as we do. If you try them, let me know. I'd love to hear from you! Please wait while this page loads, then, you can either scroll down the page or click on the links in the index! Enjoy! This recipe was originally published in Jane Brody's Nutrition Book as the one my husband usually makes to the great delight of family and friends. Hundreds of readers have told me it has become their favorite as well. It is a large recipe because it disappears fast. Preparation tip: Flavorings, if desired, are added just before the loaves are formed so that each loaf can be seasoned differently. 1. In a large mixing bowl, combine the hot milk, oil, sweetener, and salt. Set the mixture aside to cool. 2. Place the warm water in a small bowl, and dissolve the yeast and 1/2 teaspoon of sugar. 3. When the yeast is bubbly and the milk mixture has cooled to lukewarm, combine the two and add the beaten eggs. Then add the oats and bran flakes, and mix the ingredients well. 4. Add all the whole-grain flour and as much of the white flour as needed to make the dough easy to handle (it should be slightly moist but not sticky). 5. Turn the dough out on a floured board, and knead it for 6 to 8 minutes, adding more white flour if necessary. Place the dough in a greased bowl, turning the dough to coat it with the grease. Cover the bowl with a damp towel or some plastic wrap, and set the dough in a warm draft-free place to rise until it has doubled in bulk, about 1-1/2 hours. 6. Punch down the dough, and divide it into three equal parts. Knead into each part the desired flavorings, and form the pans into loaves. 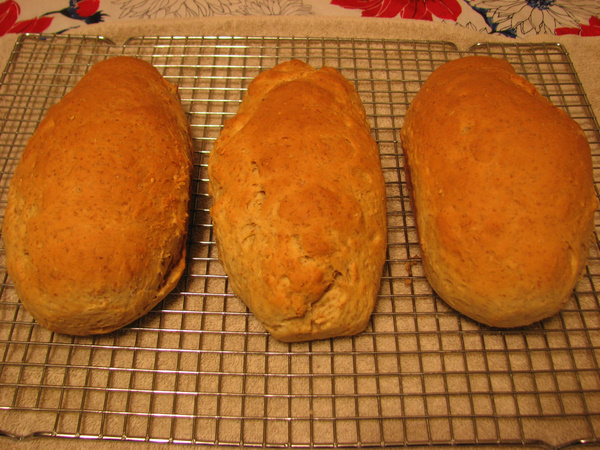 Place the loaves in greased bread pans (9 X 5 X 3 inches), cover the pans, and set the loaves in a warm place to rise until they have doubled in bulk, about 1-1/2 to 2 hours. 7. Brush the tops of the loaves with melted butter or margarine, and sprinkle them with cinnamon or nutmeg, if desired. Preheat the oven to 350 degrees. Put the loaves in the oven and turn the oven down to 325 degrees. Bake the bread for 35-40 minutes or until the loaves sound hollow when tapped on the bottom. Bread in picture made with all white flour and brown sugar. permission from W. W. Norton & Company, Inc.
Jane Brody is right that this bread disappears fast! Since it makes 3 loaves, it's well worth the time it takes to make. I use quick-rise yeast to cut the rising time in half. It also works if you add the yeast with the dry ingredients and the liquids later. Then the milk mixture should be 120-130 degrees. My family's favorite combination of the various ingredients is: whole-wheat flour, molasses, and fennel seeds. Another good thing about making 3 loaves is that one can easily be made into raisin bread, and you still have enough regular bread for sandwiches! I love making bread but it goes in spurts, sometimes I make it often and sometimes not at all. I love all the smells, even when it is just mixing! Bread smells especially wonderful when it is baking and my favorite pieces are the ones eaten soon after the bread has come out of the oven! No, I don't have a bread machine, but my KitchenAid is still up to the task! Heat oven to 325 degrees F. Rub meat all over with pepper. Put gravy mix in a 4-qt. Dutch oven ( not uncoated aluminum). Stir in wine and orange juice until smooth. Stir over medium heat until boiling. Sauce will be very thick. Add meat to pot; scatter onions and fruits around meat, and then add bay leaves. Cover pot and place in oven. Bake 3 to 3-1/2 hours until meat is fork tender. Remove pot from oven and let stand for 15 minutes. Lift roast to cutting board; remove strings. Cut meat across grain; arrange meat slices on serving platter. Discard bay leaves. Spoon some sauce over meat and serve remainder on the side. Makes 6 servings with leftover meat. This recipe takes about 10-15 minutes to prepare and then you can put it in the oven and forget about it! I call it the recipe that makes itself! All the different flavors blend together and make a delicious sauce that we usually put over potatoes! No one flavor dominates over the rest. I got this recipe from a women's magazine back in the late 80s/early 90s. I don't even remember which one anymore. 1. Place soup bone in large kettle. Cover with water and bring to a boil. 2. Discard water and save bone. 3. Cover with water again and bring to a boil. Boil for 10 minutes. 4. Discard bone and skim stock. Cook until tender, about 1/2 hour. Add one large can of tomatoes and 3/4 cup frozen mixed vegetables. This is the soup my mom made when I was a kid. I don't know who Mary Ann is! I throw in lots of veggies because I like chunky soup! It's very good with fresh muffins or biscuits! These tasty dinner rolls are especially simple to make: they require no kneading or shaping and only about an hour to rise. Preparation tips: The rolls freeze well, so may want to make a double batch. You can start them 1-1/2 -2 hours before mealtime. Place the warm water in a large bowl, stir in the yeast and sugar until they are dissolved, and let the mixture stand for 10 minutes or until the yeast starts to foam. Add the salt (if desired), egg, butter or margarine, and whole wheat flour, beating the mixture until it is smooth. Add the all-purpose flour, stirring the batter until it is smooth. Cover the bowl, and let the batter rise in a warm, draft-free place, for 30 minutes or until the batter has doubled in bulk. Stir down the batter, and spoon it into 12 greased muffin cups, filling each about half full. Let the rolls rise in the uncovered muffin tin for 25 minutes or until the batter reaches the top of the cups. Place the tin in the hot oven, and bake the rolls for 15 minutes. really put the crowning touch on any meal! Brown ground beef, onions and celery; drain. Add tomato soup, tomatoes, kidney beans, chili powder, oregano, paprika, pepper; heat to boil. Turn down heat and simmer for 45 minutes. About halfway through the simmering time, cook the macaroni. Add macaroni after it's cooked. I usually use one can of dark kidney beans and one can of light kidney beans, just for variety! In a large kettle, saute onion and celery in butter until just tender-crisp; remove from heat. Blend in flour, salt, and pepper. Gradually stir in turkey broth. Heat, stirring, until mixture comes to a boil. Add potatoes and carrots. Cover and simmer 15 minutes, until vegetables are just barely tender. Add zucchini, corn, wine and turkey. Continue simmering 15 minutes. Add parsley. **To make turkey broth, break up turkey carcass to fit into a large kettle. Add 1 quart water, 1 sliced onion and a handful of celery tops. Cover and simmer 1 hour. Strain broth. Add enough water (or chicken broth) to make 2 quarts. "Blueberry French Toast With Blueberry Sauce"
Combine Sugar and Corn Starch, add Water, Butter, Lemon Juice. Bring to a boil for 3 minutes. Stir constantly. Stir in Blueberries. You may add 1 teaspoon of Cinnamon. Given to me on May 21, 1998! 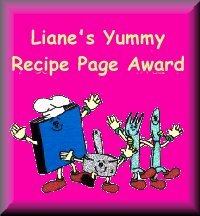 Thanks, Liane for giving me my first recipe page award!